These jogger pants are the most comfortable thing ever. They are maternity but I linked very similar non maternity above. I love that they are different then your typical black pants! I am obsessed and will be living in them cause all I care about lately is being comfortable! I have a great discount code for you guys today! Emerald Bling, one of my favorite places to buy jewelry is offering all SOS readers 15% off of your purchase by using the code JADEBLING15. They seriously have the best statement necklaces and they are so reasonably priced. Oh and the quality is great! I love the one I am wearing today because it is different then anything that I have and I feel like it can go with pretty much anything. Happy Shopping! Those pants look awesome on you, and I love your hair! You're gorgeous! This outfit looks fantastic on you! You are the cutest preggers lady! I love how you style everything! Love your clutch and braid!! Those pants look so comfy, yet still chic with the heels! Such a great combo! 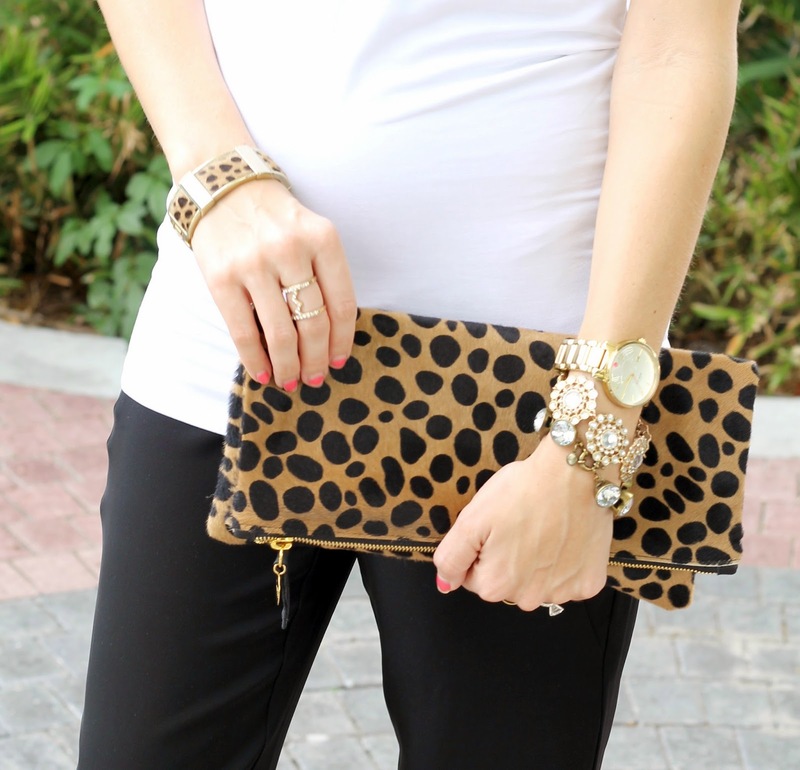 Love those pants and that clutch! Gorgeous!! I love this outfit! It's so simple yet so classy. The arm candy is perfection! those pants do look so comfortable! and I'm really wishing those shoes were available! you look gorgeous. My favorite clutch :) I loved Pea in the Pod for my maternity clothes- some were so cute and well cut they work even post-baby as cover-ups! good luck and congrats! My favorite combo ever! I love that you added a new spin to a classic with the pants and they seriously look so comfortable. Plus I think you are amazing for finding similar non maternity style options as well. You look absolutely stunning! Glad you love the necklace! You look absolutely beautiful!! And your hair is so cute. Nicole, I tried to link the tank top and the pants but tI couldn't find either online. I got both in the store... Hopefully I will have better luck finding the maternity pieces online!